Meet some of our farmer members. Read about more farms below! The love that Gallagher and Amsden share for farming is immediately apparent. Despite a long day of hard labor, the faces of the two brim with optimism and hope. “It is meaningful work that is emotionally, physically, and intellectually challenging,” Gallagher finally responds. Gallagher, a native of Cheshire, first got a taste of farm life in high school when he used to bail hay for local farms in Lanesborough. But, as he puts it, “I got away from it. I didn’t think I could make any money at it.” After graduating with degrees in Russian and Biology at Williams College, Gallagher spent a few years teaching high school math with the Mississippi Teacher Corps. Dissatisfied with the profession, Gallagher’s experience ultimately made him reconsider farming as a career. 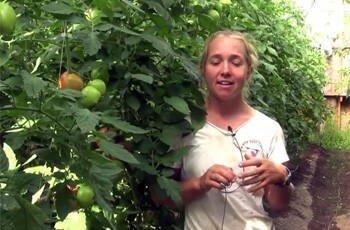 In 2009, Gallagher and Amsden met as apprentices on the same farm in Vermont. 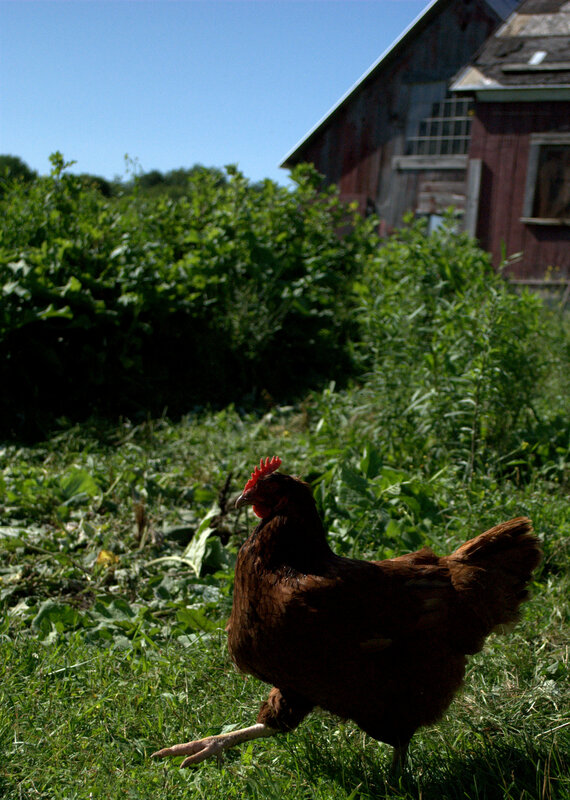 The two began Square Roots Farm, a small sustainable farm in Clarksburg, a year later. They are not only the owners of one of Berkshire County’s youngest farms – they are also two of Berkshire County’s youngest farmers. If the couple’s age and experience has put them at any disadvantage, it has not shown. 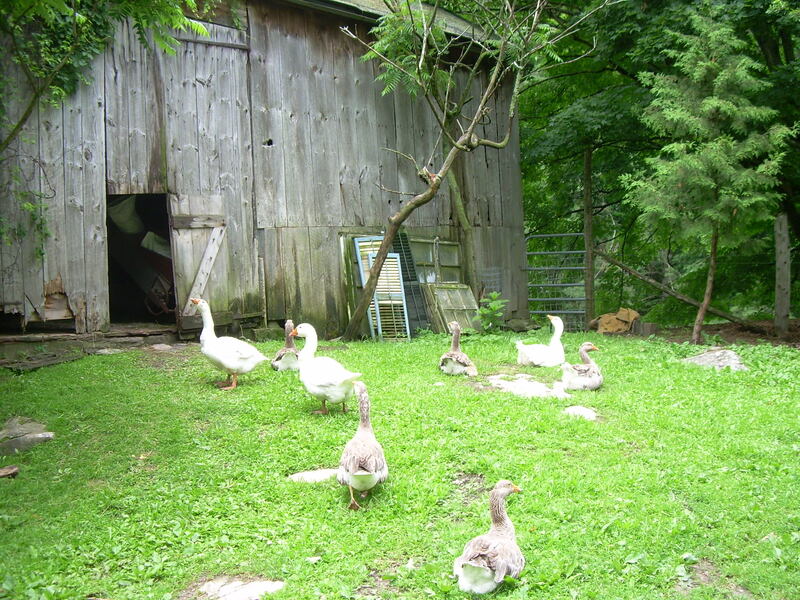 Their CSA shares have grown dramatically since their first season and they have expanded their livestock production as well, which includes pastured broiler chickens, turkeys, ducks, beef, pork and lamb. They’ve also done business with high-end restaurants in the North Adams area such as Gramercy Bistro and The Elf Parlor. The CSA model has proven essential to the farm’s success. The 20 shares sold in their first growing season provided Gallagher and Amsden with the necessary cash to lease the piece of land on which Square Roots Farm originally sat [Gallagher and Amsden have since bought their own farmland in Lanesborough]. It has also benefitted the local community. Hoosac Harvest subsidizes some of the farm’s shares in an effort to make locally grown food more accessible to underprivileged consumers in North Adams and Clarksburg. “We wanted to include as much of the community as possible,” Gallagher notes. Despite their success, the couple has continually wanted to do more. Over the span of a few years they built a poultry-processing facility, began producing eggs and explored the market for winter salad greens. In 2011, Gallagher and Amsden received a state grant to build a greenhouse on the southern end of their property with the hope that its completion would bring in additional revenue in the slow winter months. “We want modest growth,” Amsden says. They intend to cap the number of CSA shares they’ll sell in future seasons and hope to be able to sustain their farm without having to hire additional labor. As Gallagher leads his guests through neat rows of potatoes, the couple’s resolve to remain small-scale becomes immediately comprehensible – the two are committed to producing high quality food in a conscientious and humane manner. He spots a cluster of potato beetles and stoops to brush them off the plants’ delicate leaves. Gallagher continues walking for a moment then stops short, noticing another batch of the pesky critters. Forgetting that he is not alone, he becomes totally absorbed with his work. Ashley, still aware of her guests’ presence, softly chides, “We’ll get back to this later Michael.” “All right,” Gallagher grumbles. He tries to maintain a smile throughout the rest of the visit, but it’s obvious – he has potatoes on his mind. Farms don’t exist only in the low-lying floodplains, they can be found all over. What is farmed depends on location; but what kind of farming can be done in the densely forested hill town of Worthington, MA? J.P. and Marian Welch found a way to farm there; for the past 30 years they have made a home, and a livelihood, as the owners of Justamere Tree Farm. 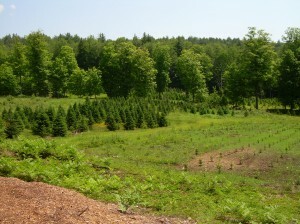 What does tree farming entail? For the Welches it involves more than 50 acres of land, maintenance of a healthy forest, and a drive to be as independent as possible. “We saw a window where we could possibly live off the land,” says Marian. The work that the Welches do is varied, but each aspect uses trees sustainably; this means no chemical fertilizers, planting new trees each year, and keeping the forest intact to preserve the health of the land. So if you imagined tree farming to mean Christmas trees you’d be right; if you pictured tapping maples and sugaring you’d also be correct. These are two of the three types of production that make up the Welches’ livelihood. The third aspect is handmade brooms, for which they wild-harvest sassafras for the handles. 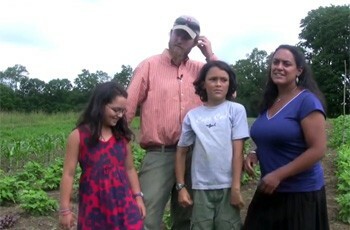 With such a varied yet sustainable lifestyle, it’s easy to see that the Welches put a lot of thought into their farm. “We didn’t have a master plan,” says J.P. “We still don’t. Everything we did just kind of evolved.” The Welches’ evolution began in 1982 when they purchased their property on Patterson Road. 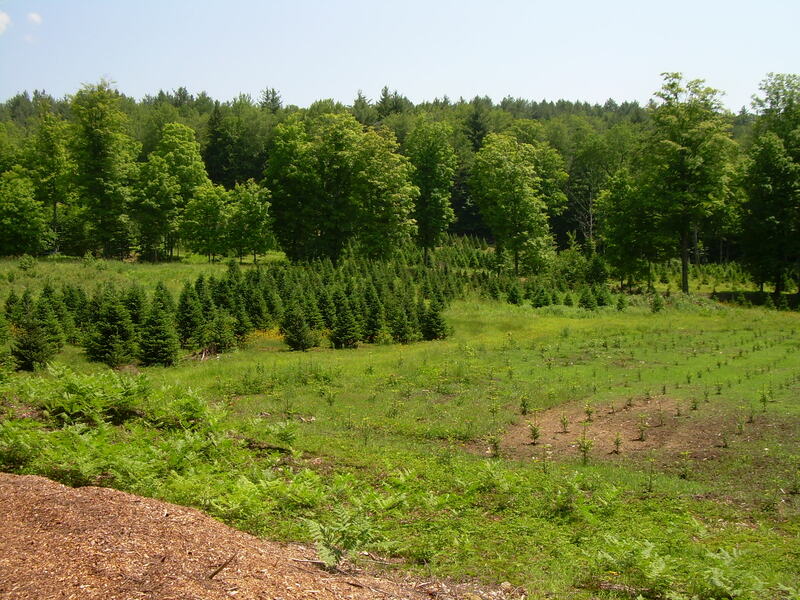 Shortly afterward, the Christmas-tree farm became the first part of their venture. It was during the wait for their first saplings to grow that the second part emerged. “We had to keep from getting bored,” says J.P. The purchase of a handmade broom, combined with the gift of some broom-corn seed, inspired the Welches to learn the craft of broom making. In a book of old-time crafts from the Foxfire series, they found one style of broom. After mastering that, they took a workshop at Hancock Shaker Village, learning the Shaker style. Over the years they kept studying and today they produce seven distinct types of brooms. Their mastering of this artisanal craft has won recognition from Martha Stewart, who featured J.P. and their brooms on her show. But long before Martha made them nationally known, the Welches had incorporated another old-timey craft into their production: maple sugaring. 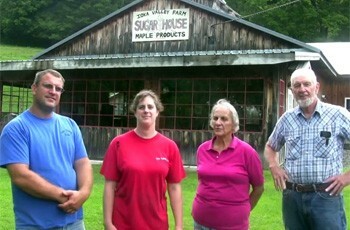 This part of their production began when they helped a neighbor tap trees one year. Today it is the largest area of their production and uses the majority of the land. Keeping true to their desire to live sustainably, the Welches have developed a highly efficient and eco-friendly method for tapping and sugaring. Thousands of feet of tubing run from maples throughout their own 25-acre property and adjoining acres that belong to neighbors. This tubing is part of their collection system and is completely airtight, allowing sap to flow directly into a holding tank. From there the sap is filtered twice, removing water and allowing sugar to remain, which cuts down on boil time. Finally, the Welches have installed a wood-fired smokeless boiler, designed to ignite all gasses released during burning and direct the heat straight to the boiling pans. This increases the energy efficiency of their boiler while at the same time reducing CO2 emissions from smoke, making their system overall more energy efficient and eco-savvy. The Welches are busy each season of the year: during the winter they sell cut Christmas trees and offer cut-your-own trees at their farm; during the spring they sugar; during the summer and fall they have booths at farmers’ markets and fairs throughout New England; all year round they make brooms, maintain the land, and ship orders for maple products and brooms placed on their website. “It’s a lot of work, but it’s so important,” says Marian. “Listen,” Damon Clift says as he holds a hand to the back of his ear, “You can’t hear a thing out here.” He pauses for a moment, basking in the silence. “That’s why we decided to leave the city.” For much of their lives, Damon Clift and Diane Creed were living in Queens, New York, before they gave it all up – the sirens, the horns, the roar of traffic – to begin an entirely new life. Hawk Dance Farm is, in almost every aspect, the polar opposite of New York City. Situated in the rural countryside of Hillsdale, New York, the silence that pervades the place is not the only indicator of its seclusion – the miles of dirt road that lead to the farm almost demand a four- wheel drive vehicle, even in good weather. It is difficult to imagine these two living in the city now. Despite having been reared in New York City, Damon and Diane both appear remarkably at home amidst the solitude. Before they chose to come to the country, Damon was a house painter, while Diane worked as a veterinary technician and dog-sitter. “We planned this for 15 years in Queens,” says Damon of the decision to leave the city life behind. Inspired by the literature of counter-culture figures like Helen and Scott Nearing and Elliot Coleman, farming began as an idealistic dream for Damon and Diane. “We always wanted to be in the country,” Diane says. While they gradually set aside money, they attended Northeast Organic Farming Association events in Queens and continued to study sustainable farming literature. Finally, in 2007, Damon and Diane found themselves in an ideal financial situation to make their dream a reality. Damon spent the next two years apprenticing at a number of New York farms, including Common Ground Farm in Wappingers Falls and Oak Grove Farm in Clinton Corners before he and Diane purchased the picturesque piece of property in Hillsdale. Escaping the city, however, would prove to be just the first of many difficulties that they would face. The tomato blight of 2009 rendered months of hard labor worthless for many farms in the northeast and Hawk Dance Farm proved to be no exception. The loss of their tomato crop was a warning of additional challenges to come. Damon and Diane found it incredibly difficult in their first year to break into already established markets with local restaurants and food distributors. “We had everything – everything – against us,” says Damon. Despite many obstacles, Damon and Diane have stuck to their principles. They established Hawk Dance Farm in 2008 with a commitment to producing high-quality flowers, herbs, and vegetables in a sustainable and conscientious manner. As a Certified Naturally Grown farm they continue to fulfill this promise. “We use the vegan-organic approach as we believe that it is more humane and natural,” says Damon. In an era dominated by agribusinesses and factory farms, such a commitment seems like a novel concept. 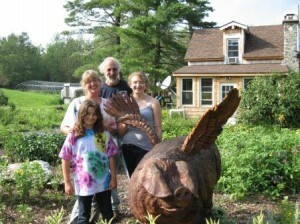 When Pigs Fly is owned and operated by Andy and Sandra Snyder. Coming from very different backgrounds, both were drawn to farming. For Sandra, her love of growing things came from her family, who grew a large portion of their own food each year. “I’ll never get tired of watching seeds germinate, ever,” she says, laughing. Andy’s interest was piqued during a research project on using methane to power farms when he was a biology major, leaving him thinking: “Someday, I’ve gotta be a farmer.” Their drive became action when they discovered property for sale in Sandisfield, a former farm that hadn’t been worked in 40 years. “It was the wild blueberry bushes that sold us,” Sandra remembers. Their goal was to provide organically grown food for their family (they have two daughters) and “to be able to feed the locals,” at a reasonable price. Starting with a little garden, their first farm stand was a table with an umbrella, set up by the side of the road. So if you find yourself on route 57, about 4 miles east of the center of New Marlborough, keep an eye out for the pig that’s poised to fly and the flag that already is, and pull over. The inventory may change with the season, but the food is always farm fresh. His passion for sustainability goes beyond his kitchen to the 150 acres that is Moon in the Pond farm. Located on Barnum Road in Sheffield, with additional acres on Foley Road, the farm is run without pesticides or chemical fertilizers. Although just a few acres are dedicated to vegetables, all of it is dedicated to food production. Either through grazing or growing hay, the majority of the property supports the backbone of his operation: meat. Moon in the Pond raises cattle, pigs, goats, chickens, geese, turkeys, and ducks. A visit to the farm brings one up close and personal with the livestock, many of whom roam freely throughout the property; you can see the calves kicking up their heels as they chase each other, follow piglets as they roam in a pack, or watch the tom turkeys fan out their feathers for the hens. Dominic encourages visitors to the farm. 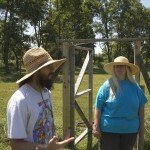 “I want people to know…that they’re welcome here to visit – keeping in mind that we’re a working farm – and see what a farm looks like and how it works.” He believes in a food culture of awareness and respect, where the perception of value is based on the work that went into the final product instead of low cost and ease of preparation. The majority of the sales is direct to consumer through a unique CSA system, for which he’s created “bacon bucks”. Acknowledging that most people are used to buying cuts of meat at the store, and not everyone has a large chest freezer, his CSA operates on a “buy as you will” principle. Members receive bacon bucks when they purchase a share, then use the bucks to get meat as needed. 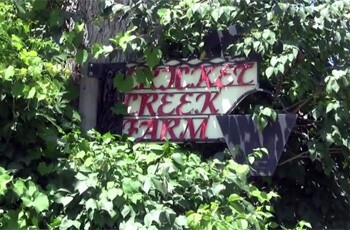 For this, people visit the farm year round to pick up from the farm stand located in the front of the barn. If you can’t make it to make it down to Moon in the Pond, you can still purchase their meat at the Millerton Farmers’ Market and Rubiner’s Farm Stands, (where you can also get some of their veggies or eggs) or find it on the menu of local restaurants. 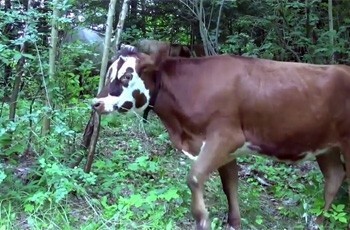 Kim Wells adores his livestock and is a farmer remarkably in tune with his animals. 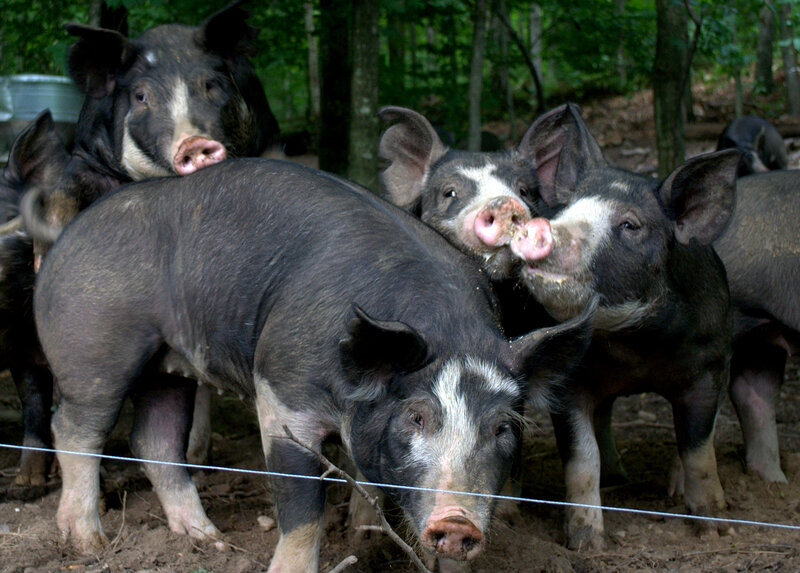 In mid-July he gave a pair of visitors to his domain, East Mountain Farm, a thorough tour of not only the chickens and cattle, which were on the central portion of the farm, but also of the pig breeds up in the woods. 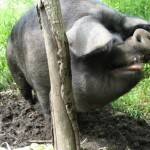 The pigs saw that they had human visitors and sprinted down the hill, coming to a sudden stop before the electric fence. 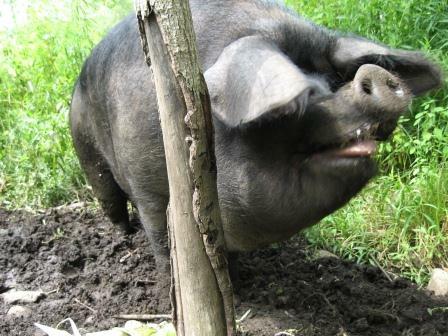 Wells laughed as he fondly told stories of his difficulty moving the pigs from one pen to the next—they are wary of the edge of the pen even when the fence is not there. “I like the way it’s evolved into beef, pigs, and chickens…it’s a good combo,” he says. Supporting such a large family of animals, however, does not come without its difficulties. Wells acknowledges a couple: “Poultry is the real killer,” he begins, explaining that there is a severe shortage of local poultry processors. Currently he must make a trip into Connecticut to get his chickens processed and inspected, but he says that it is worth the trouble to ensure quality. Furthermore, the chicken is nicely packaged. Another problem is the transport of water—the current system would need to be improved to support more livestock. Wells’ restaurant customers include Mezze Bistro + Bar in Williamstown and Gramercy Bistro in North Adams. He sends out a newsletter in late spring which allows members of the public to claim their shares of meat. 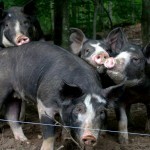 Additionally, Wells has started selling his products at Mighty Food Farm in Pownal, VT.
MacDougall has been the head of Mighty Food Farm, which is certified organic, from the beginning. 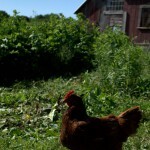 She came to the farm after apprenticing on two farms in central Massachusetts. When asked if it is difficult to keep her produce, which ranges from “artichokes to zucchini,” completely organic, she replies adamantly, “this is the only type of farming that I know of…and quality is one of the biggest issues.” The local community clearly supports her mission, as Mighty Food has a thriving CSA and Farmers Markets in both Bennington and Dorset, VT.
She points out that the quality of life, however, “is a main issue.” Even for someone so young, farming strains her body. Furthermore, she says that it is difficult to get to nearby networking events, never mind social events, since she has to tend to the farm as well as do housework. Lisa’s hard work is paying off. In addition to the large variety of CSA produce, Mighty Food also strives to provide the community with almost year-round availability in storage crops, winter greens, and greenhouse produce. 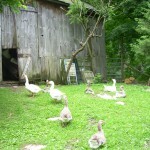 They also support nearby farms in Vermont and New York by selling their cheeses, yogurt, and breads in the CSA room. They grow and sell “pretty much the gamut,” says MacDougall. Despite the cornucopia of choice, MacDougall’s heart undoubtedly belongs to the fruits and veggies of the farm: “I love produce!”she says. The land currently holds about 17 acres of crops, with 25 acres in cultivation. There is not much waste as the leftover crops are either composted or donated to local food banks. MacDougall has an open mind about expansion goals: “I want to become more diverse with animals,” she says, pointing out that the purchase of pigs would help resolve the issue of leftover produce. Mighty Food Farm is the product of a handful of individuals, led by MacDougall, who believe strongly in the quality and accessibility of locally grown food. “I farm for myself and I farm for my community,” MacDougall says, looking out at the farm’s expanse of land and crops.